GEMMS is excited to announce the launch of our website and online database on April 21, 2018. The website is freely available through Iter: Gateway to the Middle Ages and Renaissance hosted by the University of Toronto (https://www.itergateway.org/resources/gemms). The website provides information about the project as well as links to related resources and access to the database. 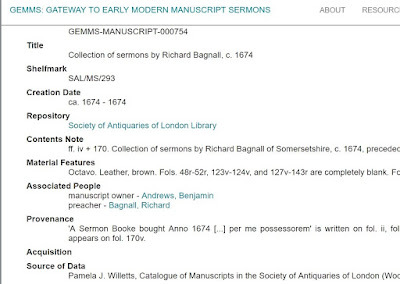 The database currently includes bibliographic information about 10,882 sermons and 55 reports of sermons from 680 manuscripts in 22 repositories in the United Kingdom and North America. These numbers are continually growing as our team adds new data. Recently, our Research Assistants in England, Catherine Evans and Hannah Yip, have been conducting research at repositories including the London Metropolitan Archives, Sheffield Archives, the Society of Antiquaries of London, and the Thoresby Society Archives. Over the next several months, Jeanne and Anne will be travelling to libraries and archives in Ireland, Scotland, and London. Meanwhile, our Iter Fellows, Adam Richter and David Robinson, have been busy adding data from North American repositories and expanding location and biographical data in records. 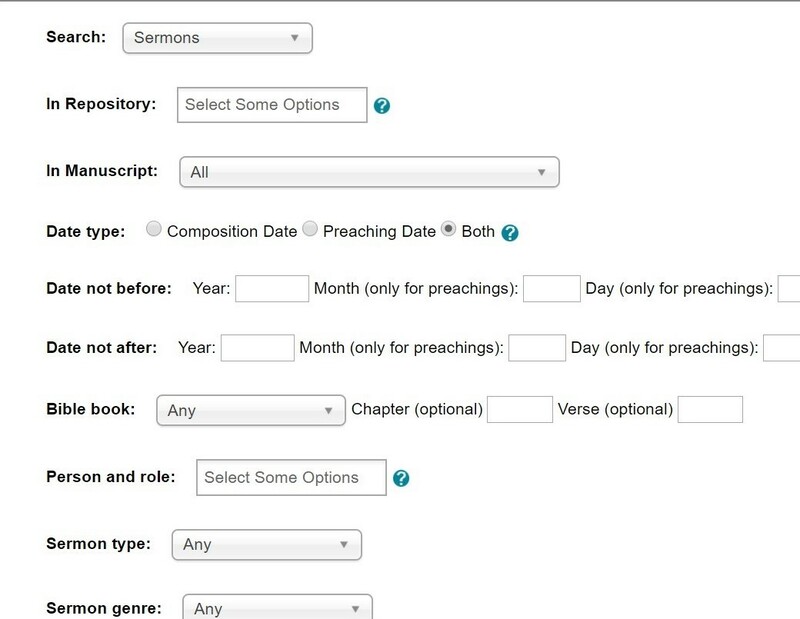 Our two main emphases over the coming year are making sermon scholars aware of this new resource and facilitating processes to allow these scholars to contribute their own data. Public access to the database will be launched at the Canada Milton Seminar on April 21 in a presentation conducted by the Iter Fellows (https://crrs.ca/event/canada-milton-seminar-xiii). We are grateful to Professor Paul Stevens for offering us this opportunity. On May 28, Jeanne and Anne will introduce the project at the Congress of the Humanities and Social Sciences in a joint session of the Canadian Society for Renaissance Studies and the Canadian Society for Digital Humanities (https://www.congress2018.ca/sites/default/files/association/2018/04/51-csrs-scer-2018-4-10-draft.pdf). Catherine Evans and Mathilde Zeeman are currently organizing a one-day workshop, “Early Modern Sermons: Performances and Afterlives,” on November 2, 2018, at the University of Sheffield (proposals are due by May 21, 2018 to mz539@york.ac.uk) where Catherine and Hannah hope to introduce the database to more scholars in the UK. Our second focus is on enabling all users to be able to contribute data to the database. At this stage, contributors may download and fill in a template on the website and submit it to the project via email (http://gemms.itercommunity.org/contributors.php). GEMMS Research Assistants will then enter the information in the database, and contributors will be acknowledged for their contributions. 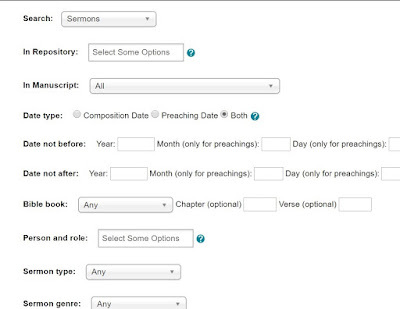 At a later date, we hope to update this process to make it easier for contributors to submit data. 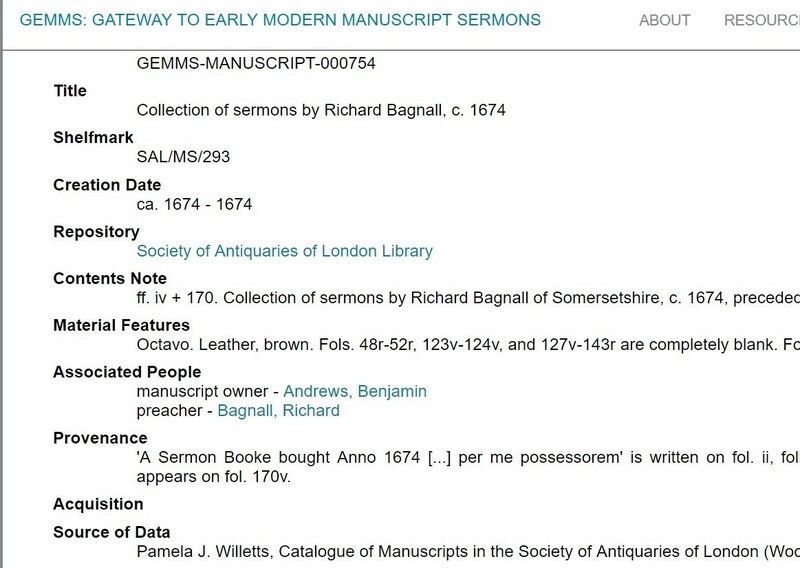 The GEMMS project was formally launched on May 4, 2017, at Dr. Williams’s Library in London, and we are grateful to the staff there, especially Jane Giscombe and Dr. David Wykes for their enthusiastic support of this initiative. Jane created the design for the website home page, while Dr. Jon Bath and Dr. Brent Nelson at the University of Saskatchewan designed the website and database and have worked tirelessly to create an effective user interface. Iter has supported this initiative with research fellowships as well as providing ongoing hosting of the site, and we appreciate the ongoing support we have received from Dr. William Bowen and Dr. Ray Siemens. Members of our board have offered helpful feedback as well as contributing data, while our research associate, Dr. Jennifer Farooq, continues to efficiently perform administrative tasks and supervise our research assistants.